Oh my goodness. Words cannot describe this burger. Hands down, one of the best I've ever had. This was the "Carnival" burger - topped with chorizo, pulled pork and black beans in a specially made "football" brioche bun. The meat / black bean mixture oozed from the burger making it the perfect dipping sauce for your fries - a choice of sweet potato, traditional "pub" chips or criss-cross fries. Sadly this burger - and their World Cup burger menu - was only a temporary event at Flaming Grill Pubs. 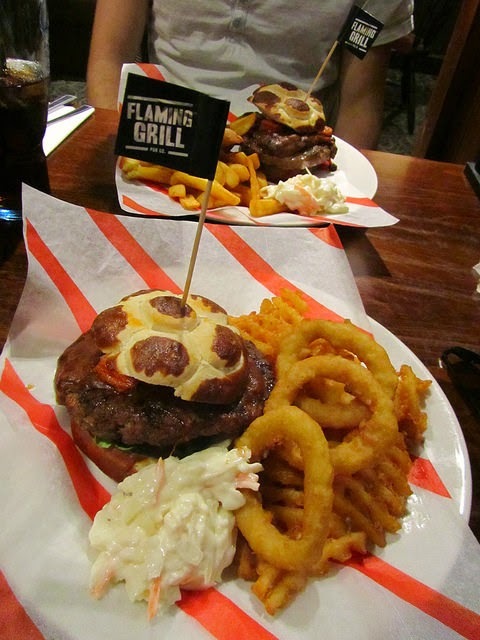 If you live in the UK, do make sure you drop into a Flaming Grill Pub at some point. They often do temporary special menus to mark certain occasions like Father's Day, Mother's Day, etc. They did a steak event a few months back which I was gutted to miss - venison steak sounded amazing! At the moment they're doing "Celebrating the best of Britain" up until 26th August and you can find full details here. If you like Man vs Food and speed eating competitions, then you may be interested in their food challenges menu. I'm intrigued by their trash can platter and may bite the bullet and order it one day... although I'd be sharing with people rather than riding solo! That burger looks absolutely amazing! I think I'd go just for the bun. I don't pay attention to football but that bun looks so cute.